Teeth affected by chips and cracks are some of the more common conditions I see here at our practice. Chips are most frequently caused by a fall, an accident, or some type of traumatic facial impact; however, many people chip their teeth when using their mouth to open a bottle or package (please never do this!). Whether the chip is large or small, it can have a dramatic effect on smile aesthetics, and may even cause functional problems and oral health concerns. The good news is, there are several advanced treatments available that can successfully correct chipped teeth and restore the appearance of your smile with beautiful, long-lasting results. There are three major treatment options that are typically performed to address a chipped tooth. A porcelain veneer procedure is one of the most popular. Porcelain veneers are thin, strong restorations that are custom-designed for the most natural fit, feel, and appearance possible. They are placed over the visible part of the tooth (not the entire tooth), and serve to “hide” common dental imperfections, ultimately making it look like the original tooth before it was ever chipped. A strong dental cement is used to keep the porcelain veneer in place, and it is color-tinted to provide a nice blend with surrounding teeth. With good brushing and flossing routines plus regular dental check-ups, porcelain veneers can last for many, many years. Cosmetic dental bonding is another common solution for chipped teeth. This treatment can often be ideal for patients who are looking for more of a “quick fix,” since it can often be completed in a single office visit with no need to wait for a veneer to be produced. Cosmetic dental bonding involves the application of a strong resin to the chipped tooth. The resin is then sculpted and hardened to look and feel like a natural tooth. While cosmetic bonding does not often yield outcomes that last as long as porcelain veneers, the results can last for several years with the proper care, and this option can be a good alternative for the right patient. 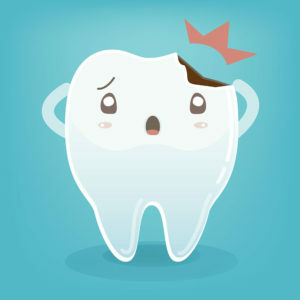 The third treatment option for a chipped tooth is a dental crown. Unlike porcelain veneers, dental crowns are custom restorations that fit over the entire tooth. Crowns are typically only necessary in cases where the tooth is so severely damaged that it needs more comprehensive reinforcement. In addition to enhancing the appearance of the tooth, a crown serves to restore its structure and offer protection from further degeneration. During your initial consultation, I can help you determine the best treatment option for your needs and goals. Remember: a chipped tooth can not only cause cosmetic concerns—it may also lead to functional issues and additional harm to your overall oral health! With treatment, you can successfully address these concerns and fix a chipped tooth with beautiful results. If you have questions about the options available at our practice, please contact us for more information.